Michael D. Huckabee is battered but still fighting. The former Arkansas governor and Baptist minister remains a dark horse in the race for the Republican nomination for US President. His enemies grow more numerous by the day, notably within his party, but he seems undeterred. He has had little by way of party machinery or fundraising acumen, two things that have culled American politics of many colourful presidential candidates. Before the Iowa caucus, he wasn't given a prayer. But he stormed home in the Republican ballot, roping in not merely the evangelicals but disaffected low-income voters. A third placing in New Hampshire and Michigan, and a second placing in South Carolina won't deter him. Senator John McCain has the pragmatic grit and Mitt Romney that political hunger that can come across as distasteful. But only Huckabee comes across as a true 'outsider' who may revitalise the Republicans. Many dislike Romney, and his Mormon background has its obvious handicaps. The obvious alternative for the evangelical Right is Huckabee. Low-income groups may well also flock to him. Other candidates are seen as unreliable. The reckless Rudi Giuliani, with his procession of wives and interest in female attire, seems more at home at an Oxbridge college rather than the Bible Belt. The radical 'mad uncle' Ron Paul is seen as too critical about American power overseas, an isolationist in modern dress. The actor-come-politician Fred Thompson comes across as incoherent. 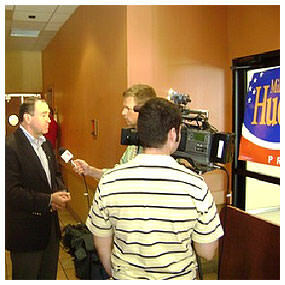 Encouraged by the former governor's populist sparkle, groups such as Hucksarmy.com have formed, seeking to fill the coffers and expand Huckabee's appeal across the country. Founded by Alex and Brett Harris, Portland twin teens keen on improving Huckabee's image, Hucksarmy.com has reached national stature. For the Harrises, supporting Huckabee is a religious duty, a 'rebellion against low expectations'. They have organised Christian youth conferences and have written a book due in April (Do Hard Things) that will read like a manifesto for Christian youth. Huckabee on economics is an interesting creature. He did something that makes Republicans apoplectic: raising taxes in his state and increasing expenditure on public services. Services were, by most accounts, improved. He is also an unabashed economic populist. He suggests the introduction of a 'FairTax', one that will literally abolish the Internal Revenue Code with a consumption tax. A flat tax on consumption is not quite as bad as a flat income tax, despite incurable limitations. Huckabee hopes to exempt those below the poverty line by providing them with rebates. His right-to-life stance is more nuanced than conventional members of the Christian Right. Gore Vidal once described America as the land obsessed by God and the foetus. Such a reading of Huckabee would be too narrow. He maintains that life after birth is just as important. To that end, he has what some Republicans regard as dangerous humane tendencies, an irksome social conscience. He has pardoned death row inmates, and commuted death sentences. Even undocumented migrants have tugged at his heartstrings, despite his current hardline stance against an amnesty. On Bush's foreign policy, he is trenchant, accusing the president of a 'bunker mentality'. A Huckabee administration, he promises, will prise open the bunker, and seek a conciliatory approach to other nations. It will wean America off its insatiable appetite for foreign oil and neutralise avenues for conflict in the Middle East. It will educate Americans on the roots of 'jihadism' (a crash course in the writings of Sayyid Qutb, for instance), and encourage the support of Islamic moderates. Those who don't fall into that category will be dealt with, using 'human intelligence', special forces and the assistance of other countries. His views on war itself are worth noting. Politicians, for all their good intentions, are incapable of handling military affairs. Reversing the wisdom of centuries, he feels military affairs should be left to the general in the battlefield. The strategy in Iraq was a mistake. The involvement of American forces should only take place when the odds are certain. 'If force, then overwhelming,' he suggests on the website Foreign Affairs. Secretary of Defense Donald Rumsfeld's endorsement of a 'light footprint' in occupying Iraq was a 'contradiction in terms'. America the bully is ever present in his mind. The US is best when it is trying to be 'a top high school student'. If it 'is generous in helping others, it is loved. But if it attempts to dominate others, it is despised'. In one of the most open races in recent American history, the primaries are bound to yield a few more results that will bemuse and startle. Although Huckabee will be accused of being everything from a religious extremist to an economic populist, his message will reach voters. The question remains whether it will carry him to the Republican nomination, and ultimately to the White House. But one thing is clear: he is not there to make up the numbers. Binoy Kampmark was a Commonwealth Scholar at Selwyn College, Cambridge. He is in Philadelphia and blogs at Oz Moses. 2 X the poverty level, you pay 11.5%. 3 X the poverty level, you pay 15.3%. 4 X the poverty level, you pay 17.25%.